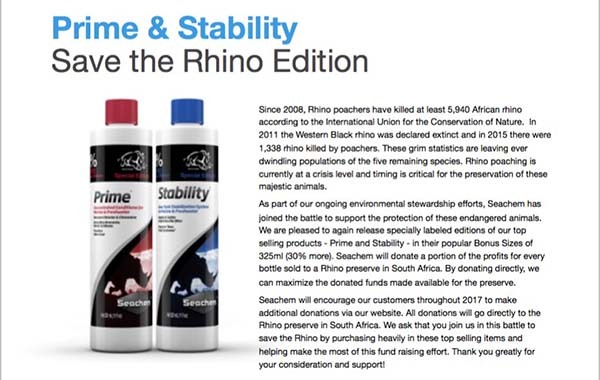 Seachem Laboratories, the well-known aquarium products manufacturer, recently announced plans to introduce new packaging on two of their best selling products—Prime and Stability—to support Rhino conservation efforts. The newly updated packaging, which will begin shipping to retailers nationwide immediately, features a conservation message and the company plans to donate a portion of the sales of each bottle sold to a South African Rhino preserve. These two new specially-labeled bottles will also feature 30% more product (325mL) for the normal suggested retail price. Rhino poaching has become a serious issue, leaving some breeds extinct and others endangered in recent years. Rhino poaching is currently at a crisis level, and timing is critical for the preservation of these majestic animals. As part of our ongoing environmental stewardship efforts, Seachem has joined the battle to support the protection of these endangered animals. We are pleased to release specially labeled editions of our top selling products—Prime™ and Stability™—in a bonus size of 325 ml (30% more)! Seachem will donate a portion of the profits for every bottle sold to a Rhino Preservation in South Africa. You can also make additional donations via our website at www.seachem.com We thank you for your consideration and support! 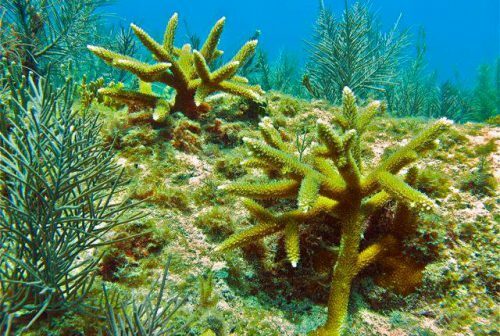 The company has also committed to making a matching donation to Coral Restoration Foundation, which works to restore damaged reefs in South Florida by propagating and outplanting young, healthy corals back onto the reefs. This offer extends through the end of 2016, and for every dollar donated through www.coralrestoration.org/seachem, Seachem will make a matching donation up to $10,000. 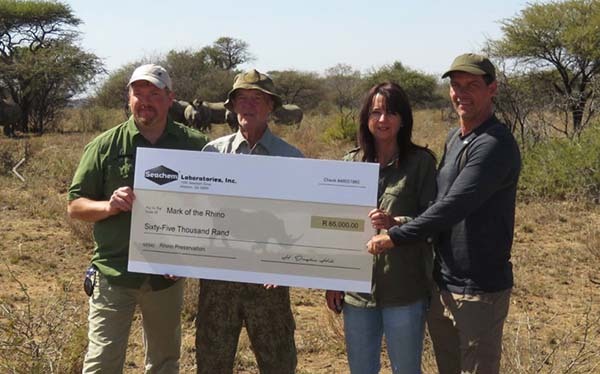 In 2015, the company donated $25,000 to this organization, and this year, MacLean said, “We are pleased to say that our supporters have donated over $9,000, bringing our donation to $19,000.00 for 2016 with a month to go.” The company notes that they plan to continue to support both Coral Restoration Foundation and Rhino conservation through 2017 as well. These initiatives, especially in light of the considerable financial support Seachem has thrown behind them, are a commendable example of a member of the aquatics industry making a significant effort to support conservation. Given the deep, fundamental ties the industry and hobby have to ecosystems—aquatic and otherwise—worldwide, it is an example that we hope continues to be followed by an ever-larger group of companies and individuals in the future.